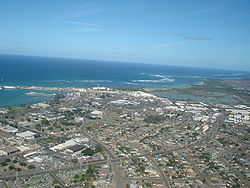 Kahului is a census-designated place (CDP) on the island of Maui in the U.S. state of Hawaii. It hosts Maui's main airport (Kahului Airport), deep-draft harbor, light industrial areas, and commercial shopping centers. The population was 26,337 at the 2010 census. Kahului is part of the Kahului-Wailuku-Lahaina Metropolitan Statistical Area which includes nearby Wailuku and the town and former whaling village of Lahaina. The retail center for Maui residents, Kahului has several malls and major stores (including department stores in the Queen Kaahumanu Center); other significant groupings of stores are in Lāhainā such as the Lahaina Cannery Mall, the Happy Valley area of Wailuku, Maui Market Place and Maui Mall, which are both also located in Kahului; and The Shops at Wailea in Wailea. Kahului is not generally considered a tourist destination. It does feature the Alexander & Baldwin Sugar Museum, Kanaha Pond State Wildlife Sanctuary, Kanaha Beach County Park, and the Maui Arts and Cultural Center. Kahului is served by Kahului Airport, located outside the CDP. According to the United States Census Bureau, the CDP has a total area of 16.3 square miles (42 km2), of which, 15.2 square miles (39 km2) of it is land and 1.2 square miles (3.1 km2) of it is water. The total area is 7.16% water. Kahului is directly adjacent to Wailuku located on the west side of town, and to Spreckelsville on the east. Kahului has a hot semi-arid climate zone (Köppen classification BSh) with a dry summer season, due to its location on the leeward side of Maui, relative to the trade winds. The normal monthly mean temperature ranges from 71.8 °F (22.1 °C) in February to 79.7 °F (26.5 °C). On average, there are 21 nights annually with a low below 60 °F (16 °C) and 25 days with a high at or above 90 °F (32 °C); readings of 95 °F (35 °C) or higher are far rarer, occurring on average once every five years. Temperature records range from 48 °F (9 °C) on January 20, 1969 up to 97 °F (36 °C) on August 31, 1994 and August 22, 2015. The record cool daily maximum is 65 °F (18 °C) on February 28, 1990, while, conversely, the record warm daily minimum is 79 °F (26 °C) on October 8 and 17, 1979. Normal annual rainfall is 17.83 inches (453 mm) spread over an average 95 days, but observed annual rainfall has ranged from 6.76 inches (172 mm) in 1908 and 1998 to 40.63 inches (1,032 mm) in 1989. The wettest month on record is January 1980 with 14.46 inches (367 mm), while the most rain to occur in a single calendar day is 5.82 inches (148 mm) on December 21, 1955. The most recent month without measurable (≥0.01 inches or 0.25 millimetres) rain is October 2013 with trace amounts, and the last without any rain is June 1957. The town is also one of the windiest places in the U.S. averaging 13.7 mph per year. As of the 2000 Census, there were 20,146 people, 5,880 households, and 4,421 families residing in the CDP. The population density was 1,328.7 people per square mile (513.1/km²). There were 6,079 housing units at an average density of 400.9 per square mile (154.8/km²). The racial makeup of the CDP was 10.06% White, 0.24% Black or African American, 0.27% Native American, 53.62% Asian, 9.91% Pacific Islander, 1.47% from other races, and 24.42% from two or more races. 8.75% of the population were Hispanic or Latino of any race. In the CDP the population was spread out with 25.8% under the age of 18, 9.2% from 18 to 24, 27.6% from 25 to 44, 20.7% from 45 to 64, and 16.7% who were 65 years of age or older. The median age was 36 years. For every 100 females, there were 97.3 males. For every 100 females age 18 and over, there were 95.8 males. Major employers in Kahului include Walmart, Maui Electric Company, Macy's, Hale Makua Health Services, Aloha Air Cargo, Zippy's, Roberts Hawaii, and University of Hawaii Maui College. Public schools in Kahului include Maui High School, Maui Waena Intermediate School, Kahului Elementary School, Lihikai Elementary School, and Pomaika'i Elementary School. 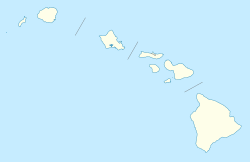 Wikimedia Commons has media related to Kahului, Hawaii. Wikivoyage has a travel guide for Kahului. Tasaka Guri-Guri — known for its "guri-guri" frozen dessert. ^ "Kahului CDP, Hawaii Archived 2011-11-20 at the Wayback Machine." U.S. Census Bureau. Retrieved on May 21, 2009. ^ a b c "NowData - NOAA Online Weather Data". National Oceanic and Atmospheric Administration. Retrieved 10 March 2015. ^ "HI Kahului AP". National Oceanic and Atmospheric Administration. Retrieved 10 March 2015. ^ "WMO climate normals for Kahului, HI 1961−1990". National Oceanic and Atmospheric Administration. Retrieved 10 March 2015.